The intersection of University and Grays Ferry Avenues is an unrelentingly gritty world of gas stations, warehouses, and auto repair shops punctuated by a tall graffiti laden silo of a long abandoned dry goods factory. 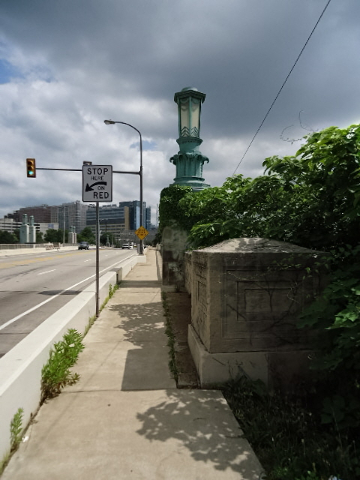 Beyond the almost forgotten Art Deco University Avenue Bridge lies the burgeoning steel and glass mini-city of the University of Pennsylvania’s Medical Center and Children’s Hospital of Philadelphia. Cross Grays Ferry Avenue and pass the Citgo service station you encounter a thicket of wild shrubs held back by chain link and razor wire with several billboards keeping watch over it all. A locked gate guards a trail leading down into the seemingly unknown realm. Further down it looks as if the shrubs are winning out, pushing past the fence toward the sidewalk as if about to attack, forcing the pedestrian too close to the road for comfort. All this appears in heavy contrast to the manicured grass (also fenced off) of the former DuPont Marshall Labs, the property now owned by Penn and planned for back office and high tech infrastructure. 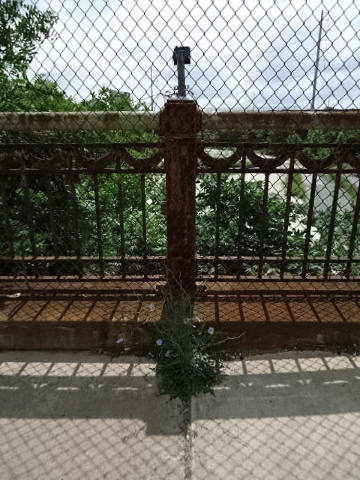 Immediately beyond, a small bridge which appears to cross over nothing but dirt gives a view over a postindustrial landscape of freight tracks, the I-76 viaduct, and the large Schuylkill power station. Should one manage to circumvent the crumbling fence at this point and brave the drop down, she would find the underpass–branded the “Batcave”–piled with junk and containing the remains of a makeshift campground, no doubt set up by “crusties” hopping the nearby freight trains out of sight from the traffic above. There is even access to the waters edge if you know where to look, presenting one of the more unique views of the Philadelphia skyline and of the span itself. 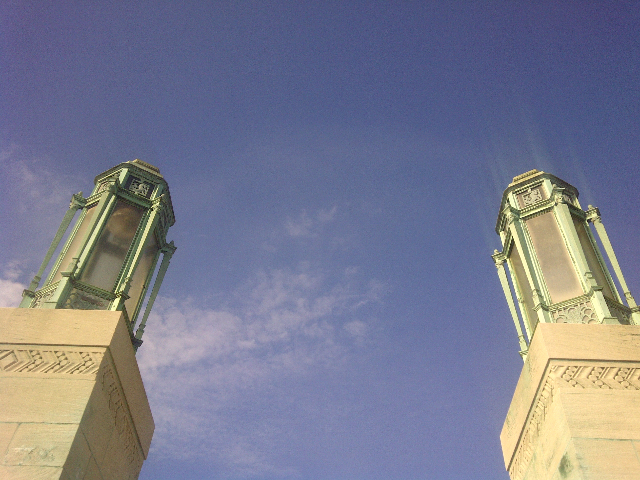 A pair of large limestone pylons marks the beginning of the bridge proper, their copper light fixtures bleeding an ethereal green upon the stonework. 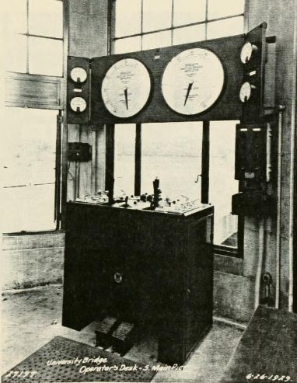 Two stone and glass turrets bookend the draw span itself on the upstream side, housing the control equipment. These are complemented downstream with large terraces watched over by twin pairs of pylons. A grand entrance is what the bridge planners had in mind from the beginning. 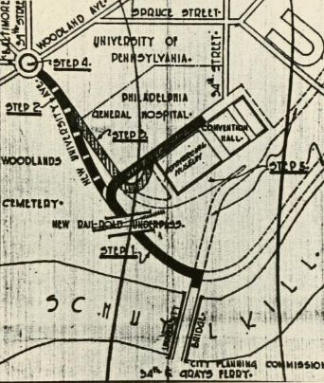 In May, 1917, with the City Beautiful movement informing the planning of municipal infrastructure, the city announced plans to link South and West Philadelphia. 34th Street would be widened and renamed University Ave where it ran from Grays Ferry through Penn’s campus. 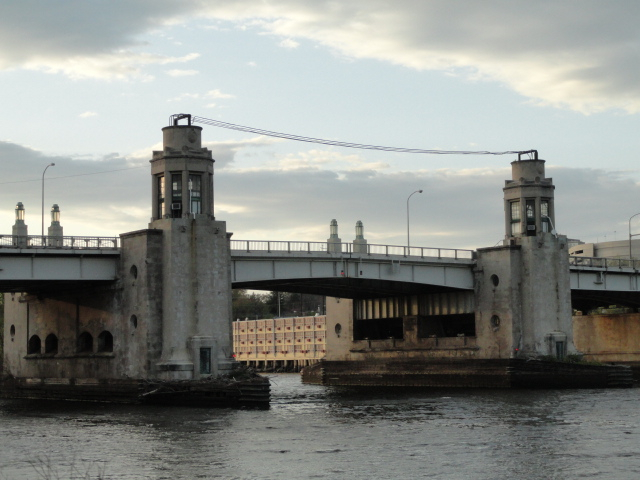 The bridge itself would be monumental–the grandest Schuylkill River crossing in the city. A Chicago-style double leaf bascule draw span was to be anchored by soaring viaducts extending more than half a mile, vaulting over the Pennsylvania Railroad tracks on the west and a spur from the Baltimore & Ohio serving nearby industries on the east. Estimated cost: $1 million. 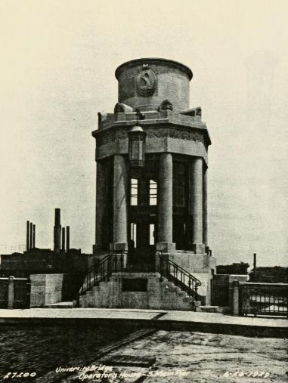 After delays due to World War I and funding shortfalls, revised plans were approved by City Council in November, 1925–with an extra $300,000 tacked onto the cost. Engineer Steven H Noyes was in charge of all structural work while John A Vogelson was put to task on the mechanical workings. Renowned architect Paul P. Cret was brought on as consultant. 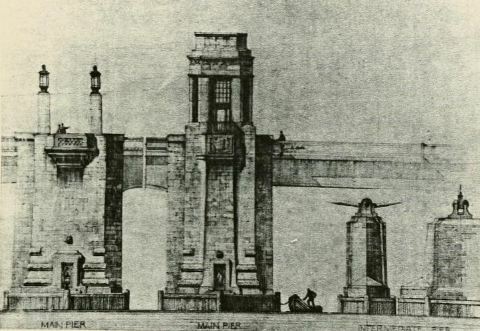 Their design, presented in April, 1926, immediately drew the ire of officials from Woodlands Cemetery and Penn who objected to a massive viaduct cutting through 34th street. Revisions were made that tunneled the Avenue under the Pennsylvania Railroad tracks instead. 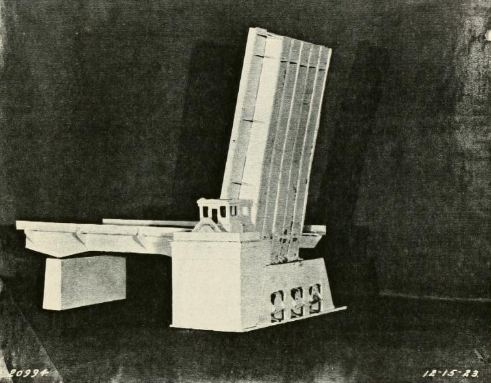 Approval from the U.S. War Department, necessary for all crossings over a navigable waterway at the time, and the Philadelphia Art Jury, who had final judgement over the structure’s appearance, came in March, 1927. The construction contract was approved in June and work in the river began in October. 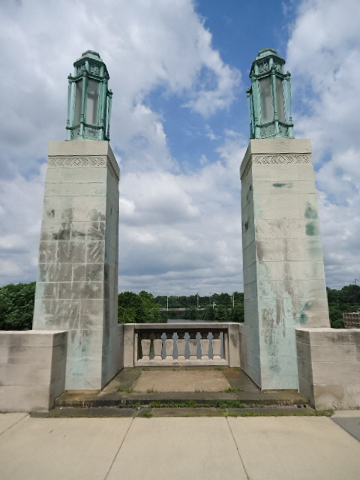 By early 1928, the foundations were complete and by December of that year the steel concrete and Indiana limestone structure was fully finished and ready for traffic. 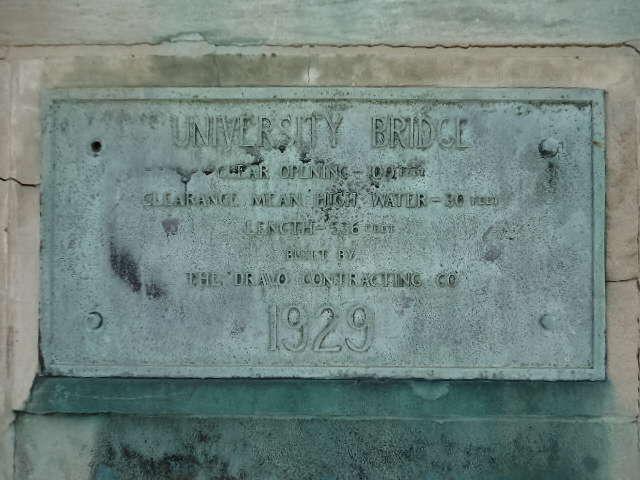 Dedication plaques were affixed to the structure in 1929. But there was a slight problem. The $1.3 million contract covered only the bridge itself, not the roads that approached it. For several years not a single car crossed the bridge, yet the City paid bridge keepers to raise and lower the span on a frequent basis instead of just keeping it in the raised position. It took a new administration, more negotiations with the railroads, political infighting, and weather-related construction delays before the approaches, including the short span over the B&O spur, the underpass beneath the PRR, and the 34th Street improvements, were complete. On May 10, 1933, more than four years after the bridge’s completion, the first car crossed the span. As the decades progressed the industry that surrounded the east approach faded away leaving behind vast swaths of undeveloped land. The draw span is rarely put into use (there was a daily barge servicing a fuel depot near the power plant until recently). 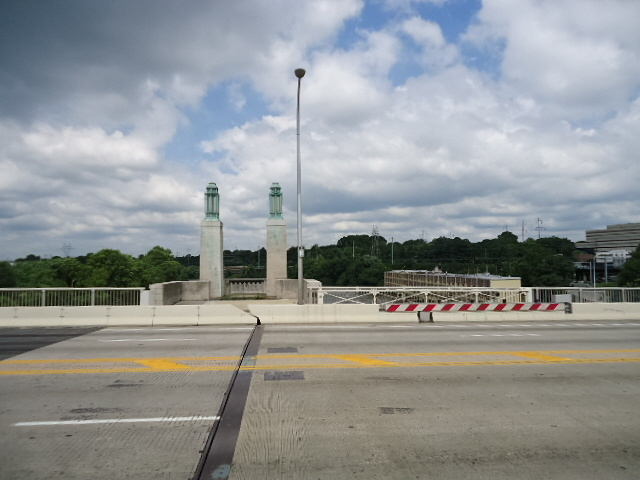 Now the once ambitious Art Deco bridge is considered nothing more than another route from point A to B. Almost 80 years since its opening, it seems that is about to change.